Rob Eagle is taking "Harding and His Camera" to Lisbon and Glasgow! On 20 September 2017 it'll be screened at the Queer Lisboa 21 International Film Festival, and on 29 September at SQUIFF Festival in Glasgow as part of SQUIFF Shorts: The Gayz. Rob Eagle has taken "Harding and His Camera" to the ﻿FIRE!! Festival in Barcelona﻿. Screenings took place on 9 and 13 June 2017. On 19 March 2017, Amara Thornton and Michael McCluskey participated in a Q&A session after the premiere of a new film "Harding and his camera" by Rob Eagle. "Harding and his camera" incorporates digitised footage from Harding's archive and interviews with Amara and Michael. The screening was part of the free BFI Flare festival event "Fifty Years of Queer History through the Moving Image and Beyond". Thornton, A. 2016. GL Harding presents: Digging in Palestine Archaeology on Film. British Archaeology (July/Aug). pp 38-43. On 26 September 2015, Amara Thornton and Michael McCluskey spoke at a special event organised by the Croydon Airport Society. Beginning with a tour of the original 1928 booking hall and air tower, the event featured talks about flying archaeologists in the 1930s and a screening of the film The Human Adventure. Filmed from 1932-35, this dramatic cine-journey included aerial shots of ancient sites in Egypt and Iraq. The film was produced by The Oriental Institute at the University of Chicago, whose work in Persepolis is captured on camera along with narration by Charles Breasted the original 'flying archaeologist'. The programme opened with examples of the aerial photography of pilot Captain Gordon P. Olley from the Croydon Airport Society archive curated by Debbie Challis, who also produces Croydon Airport Calling, the society's official blog. Michael McCluskey began with a talk on documentary films about flying from the 1930s. Included was a clip from the 1934 film Air Post with shots of Croydon Airport in action. Drawing on archaeologists' archives and memoirs, Amara Thornton explored the journeys that excavators made from Britain to sites in the Near East. She included details about the first flight taken by renowned Egyptologist Flinders Petrie from Croydon to Le Touquet in July 1933. 'Better than a camel!' he claimed. Lindsay Allen provided context to the film The Human Adventure and the The Oriental Institute's work at Persepolis. In particular, she drew attention to the activities of Field Director Ernst Herzfeld (who brought with him some unexpected items including a bottle of Johnnie Walker and a fancy dress costume). The setting for these talks and the film screening was the Aerodrome Hotel built in 1928 for passengers flying in to and out of Croydon. Thank you to Debbie and the Croydon Airport Society for organising this event and providing volunteers to help make it a success. In July 2014, Filming Antiquity team member Michael McCluskey presented his on-going research into 1930s film footage of the Egypt Exploration Society’s excavations at Amarna, Egypt. In “The Dig House: Amateur Film as Artifact”, Michael used the footage to address the overarching theme of the 15th Annual Northeast Historic Film Summer Symposium (Wunderkino 4): domesticity, house and home. His presentation, and the footage preserved in the Egypt Exploration Society’s Lucy Gura Archive, are reviewed in Moving Image Archive News. The Egypt Exploration Society’s Director, Chris Naunton, has created his own films featuring the Amarna footage. The two part series uses the films to highlight John Pendlebury, the excavation director at Amarna during the years the footage covers, as well as the excavation of an ancient lintel at Amarna. Naunton weaves the footage together with images of photographs, newspaper clippings and Pendlebury’s own notes. Over the top of these visuals are Naunton’s spoken narrative and audio interviews with two women who worked with Pendlebury at Amarna in the 1930s: Julia Samson and Margaret “Peggy” Drower. Naunton, C. 2010. The Film Record of the Egypt Exploration Society’s Excavations at Tell el-Amarna. KMT 21: 45-53. 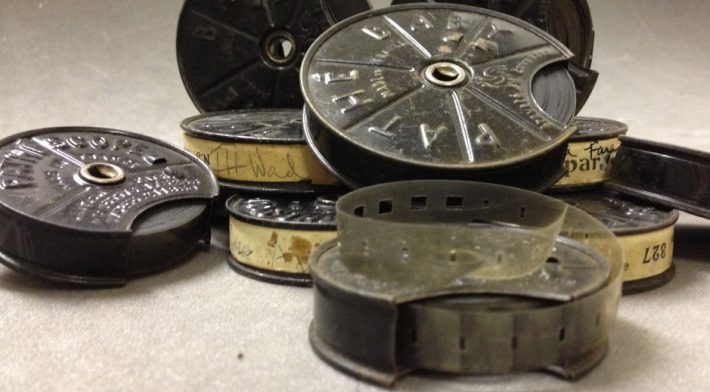 The film canisters in Lankester Harding's archive are now held at the UCL Institute of Archaeology. These small canisters are the raw materials for our digitisation project. A selection of the Harding films. Image: I. Carroll, 2014.